Scented Gingerbread Man Ornaments – Kid Crafts! Here’s a gingerbread man that won’t try to escape from your oven. This gingerbread man is a very simple, fun project for kids to make. It’s a great sensory experience too! 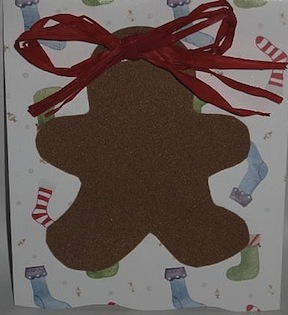 Step 1: Using a gingerbread man cookie cutter or stencil, trace the gingerbread man shape onto a piece of sandpaper. (If you don’t have a cookie cutter or stencil, see the resource section of this article for a printable stencil). These Gingerbread are too cute to eat! If you are looking for an easy holiday craft, this could very well be the answer you’ve been searching for. Visit here to get the rest of this project. 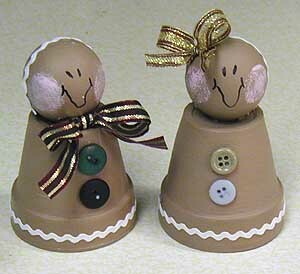 This is a fun little Gingerbread craft project ~ a Gingerbread Goodie Can. 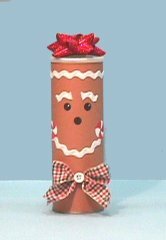 Fill your goodie can with yummy Gingerbread treats! Print out the patterns and trace around. Then cut them out with the color of construction paper shown. Lines of detail were added with the black or red markers. To add a glisten to the eyes, simply apply a dot of whiteout. Visit here for the pattern. This would make a great kid craft and a great way for you and your family to spend some “family time” on this activity. So gather the children together to help build this special Gingerbread Sleigh complete with Santa and Rudolph!